Rehearsal with Michael and Jon. So many songs! The new material was rehearsed, a tentative set list was created and tomorrow we will play the set in order. My orchids keep on blooming. I’m fine with that. Numbers like that help explain why climate change is poised to clobber the global wine industry, a multibillion-dollar business whose decline would also damage the much larger industries of food, restaurants, and tourism. Very interesting article about grapes. I have long felt that nothing will really be done about climate change until the big corporations start seeing losses… should the flood waters come close to Disneyland, or the wine industry in Nappa fail, well, action will be taken then. How to choose the right bicycle size? After a quick trip to the Phoenix area, where Michael and I played for a private party, we came home on Saturday. Rehearsals for the East coast run start tomorrow. Time to think up a set list. The drink was invented in the Roaring Twenties by Franz Xaver Kugler, a fellow who is as home-grown a Bavarian as pretzels and lederhosen. Herr Kugler was a railroad worker turned innkeeper who opened his watering hole, the Kugleralm (meaning: Kugler’s alpine meadow), toward the end of the nineteenth century in a little place called Deisenhofen, some 12 miles outside Munich. When, after World War I, bicycle riding became a popular pastime in Germany, Herr Kugler arranged for the construction of a bike trail through the forest, from Munich straight to his establishment—only to get himself into trouble…almost. He had not planned for what businessmen call the up-side risk, when, on a fine Saturday in June 1922, some 13,000 cyclists descended upon the Kugleralm and demanded beer. They almost depleted Franz Xaver’s stock of brew. The Kugleralm without beer would have been a catastrophe! But the quick-thinking innkeeper had a bright idea. He had several thousand bottles of clear lemon soda in his cellar, a beverage that had proven virtually unsaleable to his beer-loving Bavarian public. To save the day, and to get rid of what he considered some useless inventory, he mixed this lemon soda with his remaining beer at a 50/50 ratio and proudly declared that he had invented this concoction deliberately just for the cyclists so that they would not fall off their bikes on their way home. He called the mixture a Radlermass (Radler means cyclist in German, Mass means a liter of beer). In Herr Kugler’s case, need became the mother of invention. More history here. Boris told me that this is also called “Alsterwasser”. The Alster is a river in the North of Germany (wikipedia entry) and wasser means water… and I just found an entry in the German Beer Institute North American website. I also found an entry for the best beer in the world. Thats was me, taking a photo on Friday Morning. Photo by MC. 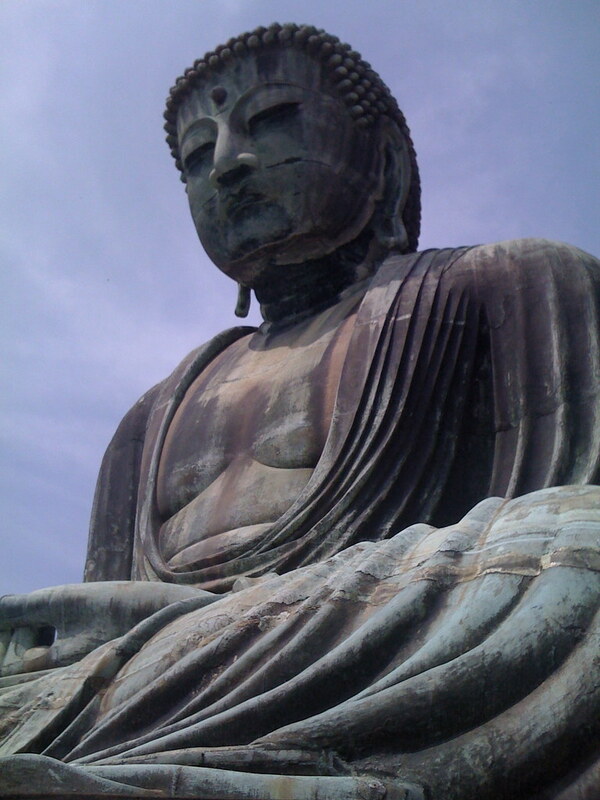 The second Great Buddha of Kamakura. The first, made of wood and was damaged by a storm and later by fire. Replaced in 1252 by this work in bronze which at one time was covered with gold leaf and only the ears have a big of gold still detectable. The swirl on the forehead is made of silver. It has endured earthquakes and tsunami. Check yer logins and change your passwords, I suppose. Good luck. A hacker who calls himself Kirllos has obtained and is now offering to sell 1.5 million Facebook IDs at astonishingly low prices — $25 per 1,000 IDs for users with fewer than 10 friends and $45 per 1,000 IDs for users with more than 10 friends. Looking at the numbers, Kirllos has stolen the IDs of one out of every 300 Facebook users. Quoting: ‘VeriSign director of cyber intelligence Rick Howard told the New York Times that it appeared close to 700,000 had already been sold. Kirllos would have earned at least $25,000 from the scam. Howard told the newspaper that it was not apparent whether the accounts and passwords were legitimate, but a Russian underground hacking magazine reported it had tested some of Kirllos’ previous samples and managed to get into people’s accounts. I’m with Stephen Hawking on this one. Even if we were show to them we can calculate pi to a billion decimal places, aliens are bound to be trigger happy when they meet us for the first time. And given our past form, who would blame them? This pre-sale order page will only be available for the two weeks leading up to the release date. *I mean, look at this mess. Listen to it. What the heck is left of them and their craft of music? Every aspect of production, distribution, socialization even, has been virtualized and network-distributed. Musicians have really been close to the fire there for a long time. And their troubles aren’t over, either, not by a long chalk. *When someone chooses to halt this potentially endless digital process, a stream of ones and zeros reverberates out of a speaker somewhere. Although that artifact still strikes the human ear as music, it’s got about as much to do with analog music as an ocelot-patterned synthetic rug does with an ocelot. I can dig that, but there is a satisfaction and joy musicians derive from playing old-fashioned analog instruments that I can’t imagine a writer to understand. Words are intellectual, they don’t contain the kick to the belly that a turn of melody or a chord change or a rhythm can give the musician. No sir, I’ll take struggling as a musician over hitting a typewriter any day. Your job is solitary, lonely, and you have no idea what it feels like to play in a group. While it is true that music production and delivery has been digitized, that is only partially true for the actual making of music. Sure, there are plenty of all-digital keyboards and there are samples of french horns, but to actually play a french horn you still need training, experience, and lips that form the tone through the mouth piece. And while in many cases the digital french horn sample will suffice, often it does not and a player has to be called in to give a phrase life and meaning. *Okay, fine. What’s done is done, right? But now have a listen to this — especially the sequence around and after 2:20. Do you hear how warm and flat and squinchy that music sounds — kind of stretched, somehow, and especially the very disturbing background rhythm under the drums, that is subtly drifting out of phase? That music could not possibly be created with human hands. That is Brian Eno manipulating analog tape loops. Yes, ANALOG tape loops, with STRIPS OF RECORDED PLASTIC. In 1974. You can still pick up an acoustic guitar and learn to play it, but you can no longer get THERE from here. The high-tech studio of 1974 is dead-media. You’re about as likely to find music of this kind now, as you are to find a jaguar stalking around downtown Mexico City. Yes, true, but not a big deal methinks. Soon one might be able to use an iPad to control phasing-shifting. Originally phase-shifting was done by using two tape-machines playing back the same music. The proper term is actually flanging. If not properly maintained the two machines would drift apart and if this was done with studio tape recorders, the engineer might help the process by laying a hand on one of the reels, thereby slowing it down a tiny amount… I believe flange is an English term for the reel that contains the audio tape. Another thing worth pointing out is that flanging was a studio technique, not a musician-expression. It was an idea producers came up with. If you have any interest in Apple products or smart phones in general, you might have heard about the 4G iPhone that was stolen and outed by that rag Gizmodo (((now deleted from my RSS feed))). The best summation of the events can be found on Daring Fireball today, though this article is also worth reading and I love this post about the design. Since I am a huge Dieter Rams fan, (((a genius and arguably the most influential designer of the 20th century))) I love the new design and look forward to replacing my “old” 3G with the new phone when my two-year contract is up in September. There is more I want to write about, but I am running out of time. I am leaving at noon for a gig with Michael and will be back on Saturday. Won’t take my laptop. The first sample was taken from the second track, Blue by Blue. Dancing Alone. This second example is the only solo that was overdubbed. The reason for that was that Jon used a fretted bass with a piece of foam wedged under the strings (((it’s a James Jamerson thing))) for the song and he wanted to do the solo on the “singing” fretless. You actually hear both basses here. The fretted bass plays the root and the fretless solos. The third excerpt is from track number ten, Sixteen Hours. No matter what the chord changes, Jon will find something lyrical and melodious to play! This last examples was taken from track number six, Tokyo After Midnight. I have presented this already, but this here is from the final mix.